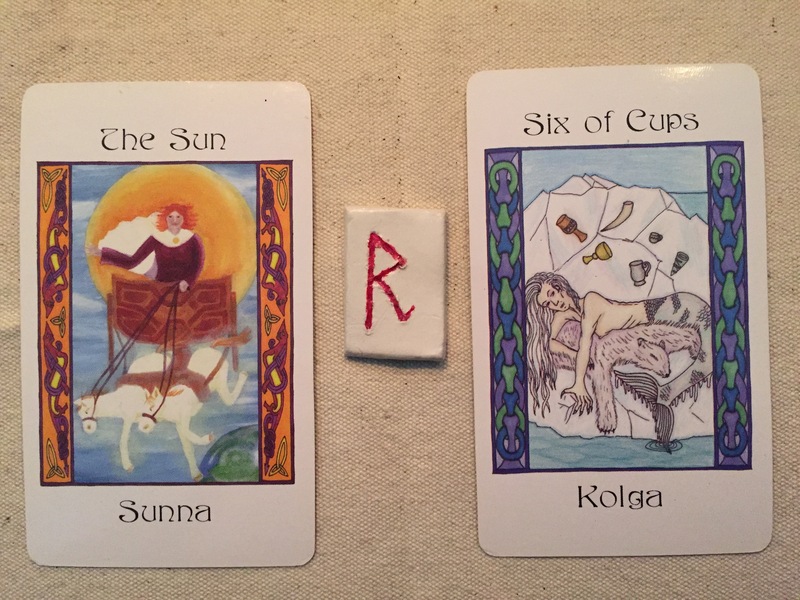 Today’s Draw: Sunna/The Sun; Raido; Kolga/Six of Cups. If you’ve been feeling stuck, energetically or emotionally, today is the day the ice melts. Be prepared to move, to think quickly, to act quickly, to take advantage of new possibilities. 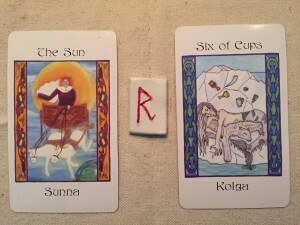 Sunna melts Kolga’s ice, freeing the emotional energy that’s been trapped in whatever we have been stuck in–anxiety, depression, indecision, anger. Whatever it is, it’s coming out today. Ground yourself so that you manage the emotional energy in a constructive manner, channeling it into change and progress, rather than simply lashing out. Use the energy instead of being overwhelmed by it. Think about what is going on, process your emotions, then speak. Things will go much better if you do them in this order. Raido is all about movement and change. Ride the wave of energy–think of it as riding a horse, or surfing a wave. You can’t control where it goes, but you can direct it, and use the energy to your advantage. Be nimble, be quick, and be aware of your emotional state before you jump over that candlestick.